Yes, it's the time of the year again when my kids are going to turn a year older! 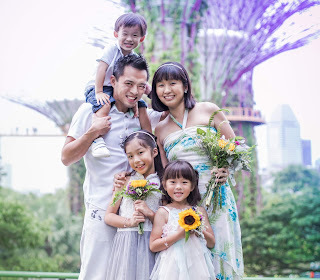 Having three year end babies, two of whom have birthdays which are two days apart, means that it's quite a busy period for us every end of the year. 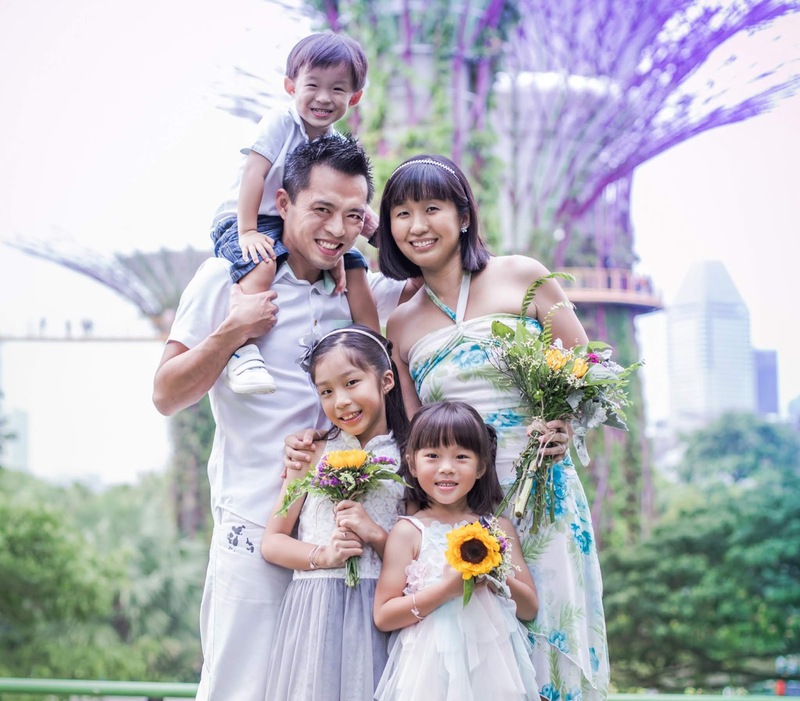 Now, while we don't have grand celebrations and even our home parties are just intimate affairs, I still like to make their special days feel a tad more special just to build up the precious memories during these fleeting years. With the house moving that is happening very soon, it's going to be quite impossible for us to hold the parties in the comfort of our own home - which is what I've tried to do all these years. 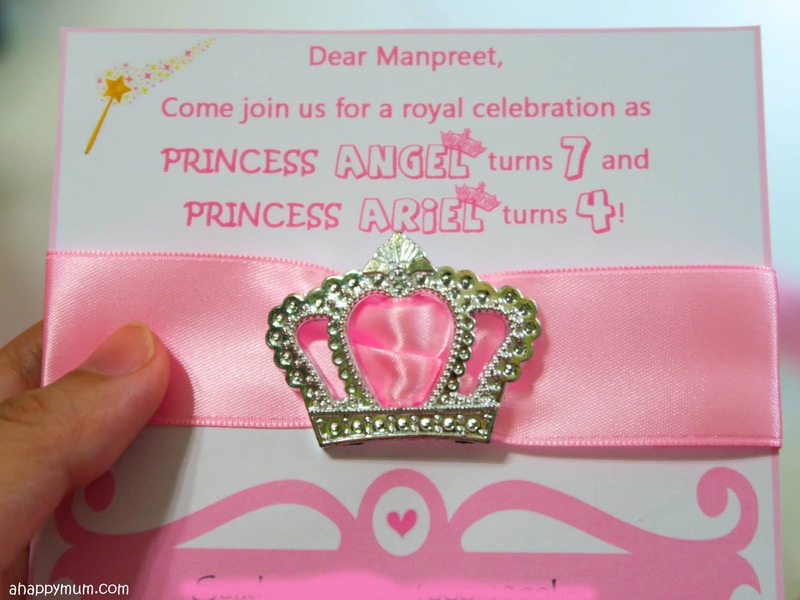 So, we'll be outsourcing venues for the kids' birthdays this year and I'm happy to share that The Tiara Society has kindly offered to host a Princess Party for Angel and Ariel! Yes yes, it's going to once again be a combined party for the girls but following its success last year, I actually feel it's quite sweet to let these two sisters share the joy, enjoy the celebration and blow the candles as one. So, some of my friends said I'm silly to have rejected the birthday invitations and party favours, which could have been provided for our guests and we didn't need to put in any effort, and instead insisted to make our own despite our mayhem at home. 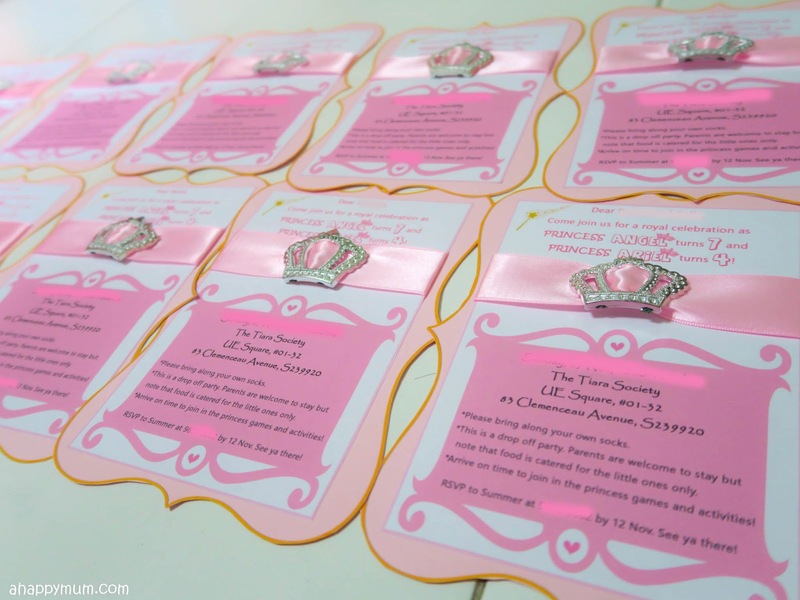 It's just a small token of our sincerity and the least we could do to show our appreciation to the guests who are going to be a part of the special day. 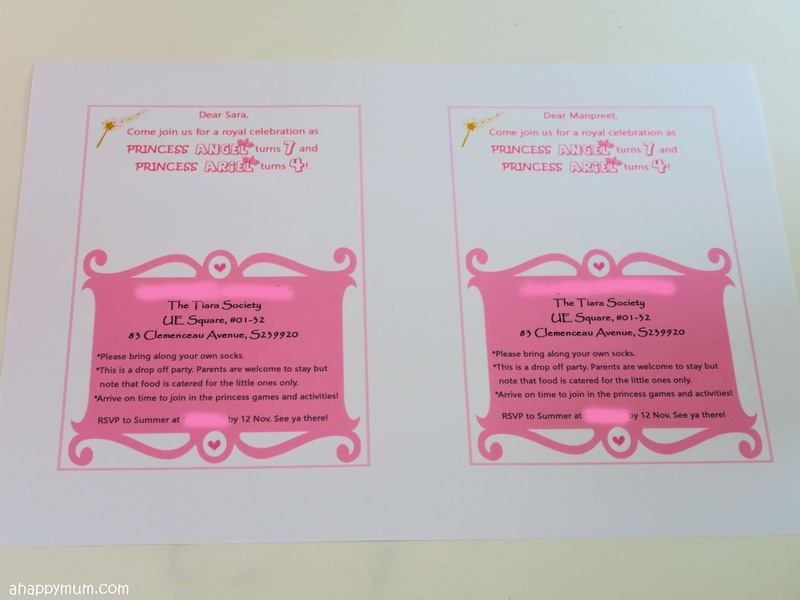 I'm also determined to let the girls play a part in making the favours because I want them to make something simple yet personalised and speaks of love from their hearts. 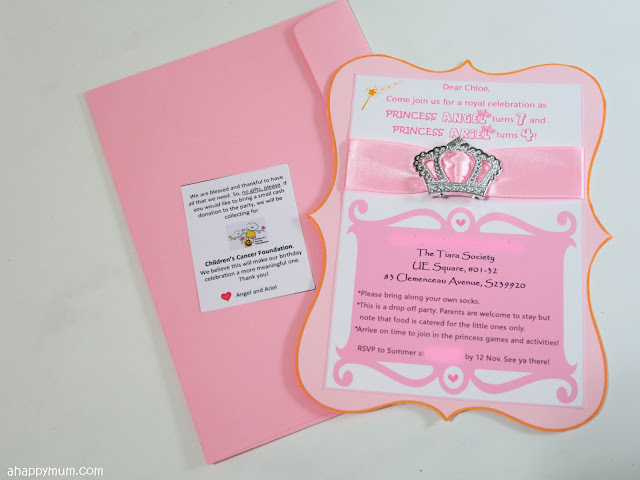 In this week's Creativity 521, I'm sharing about the Princess Party Invitation which we made. Firstly, I decided that we would make our cards A5 in size. I searched for a nice wavy border and made it gold/dark yellow colour in Photoshop. This will be the shape and outline of the card. Next, I designed the text and added in some banners and shapes to jazz things up a little. You can search for clipart, free downloaded backgrounds/banners, make use of different fonts to make things more exciting. I love how we can get to personalise the names of our guests before we print out every card too! Make sure that the text fits nicely into the gold border with a little space all around it. Now for the highlight of the card! I really love these crown acrylic buckles that I bought on eBay after searching online for quite some time. I got a pack of them which contained 100 pieces and cost me below S$20. Yup, that means each buckle was less than S$0.20 but see how pretty it made the card look! As you can see, I left a blank space when I designed the text so that I could add in a strip of ribbon and slide the buckle in, as shown above. To secure the two sides, I used sticky tape to stick the ends of the ribbon behind the white paper. 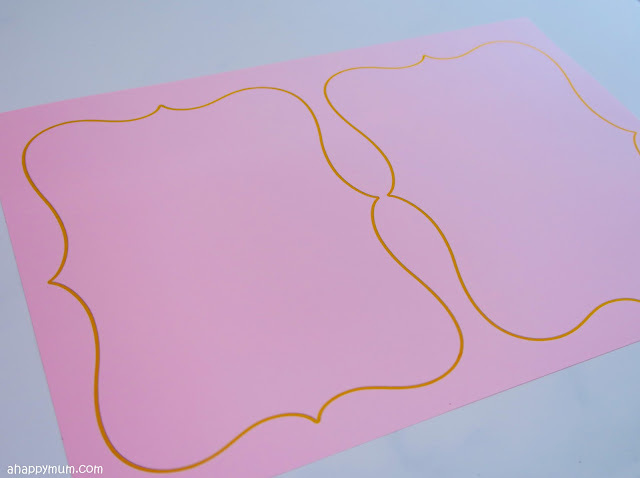 Lastly, I used a thin strip of double sided tape around the back of the white paper and stuck it down to the pink card stock with the gold border. And we are all done! Not too bad, right? Here's a closer look at the card! The girls were so thrilled to be able to pass out these invites to their friends and classmates and we hope they could feel a little of our sincerity and excitement. There's still something heartwarming about being able to feel and touch a real invitation card, and not e-invites. For the first time, which I'm hoping is the start of many to come, we are also asking guests NOT to bring any gifts and if they would like to play a part, we would be collecting cash donations for Children's Cancer Foundation instead. I was pleasantly surprised and happy that the girls readily agreed to it when I suggested the idea and we are glad that this joyous occasion can be made more meaningful. It might just be a small token and simple gesture, but it speaks volumes and I hope the kids will always find joy in giving. 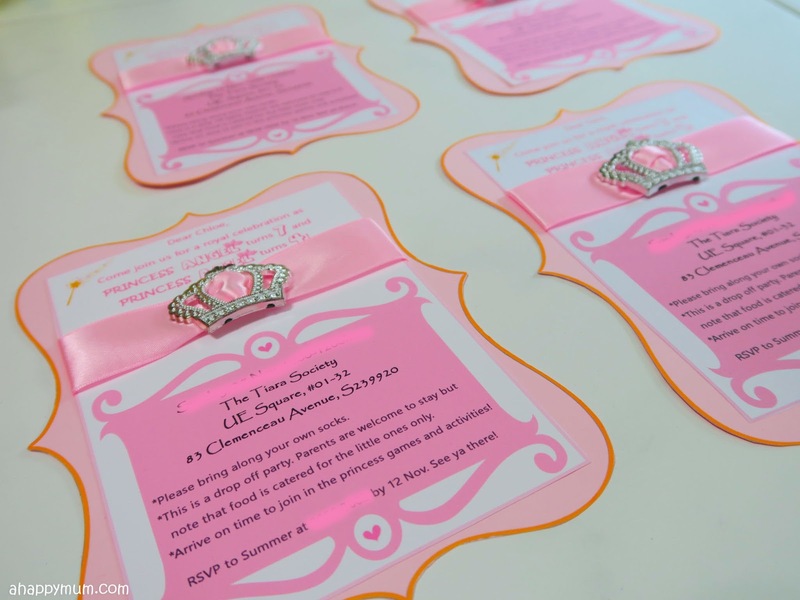 For now, we are just looking forward to the BIG day and will share more with you about the princess party very soon! 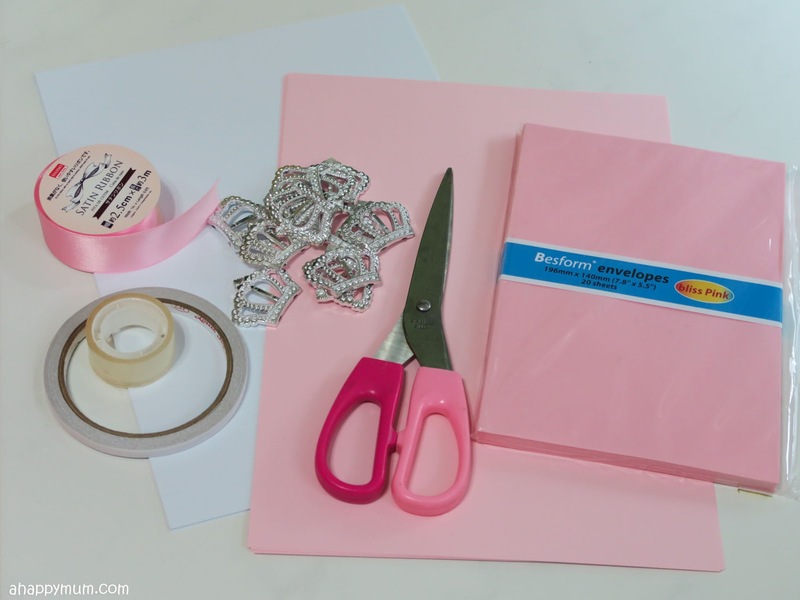 For more craft inspiration and DIY tutorials, visit my gallery here.